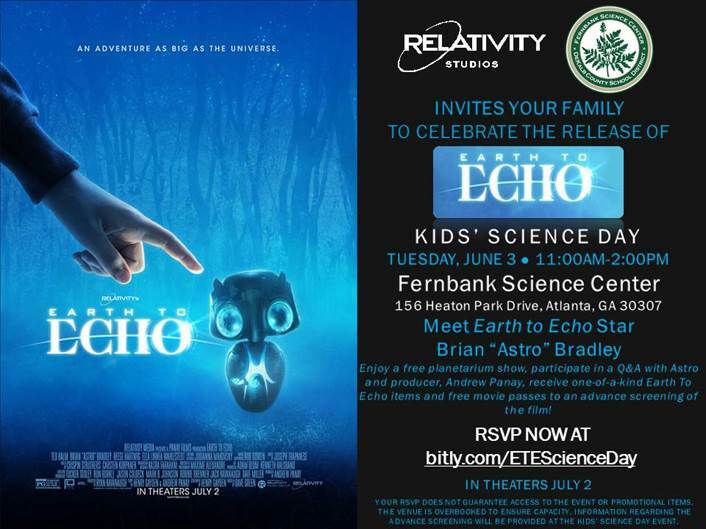 Relativity Studios and Fernbank Science Center invite you and your family to celebrate the release of their new family-friendly adventure film, EARTH TO ECHO! 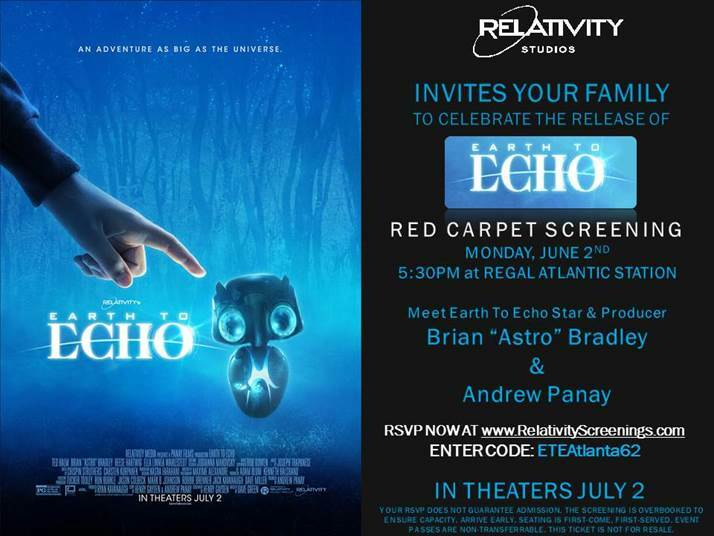 In celebration of the movie, star Brian “Astro” Bradley and producer Andrew Panay will be at the Fernbank Science Center for a special fan meet-and-greet and Q&A. 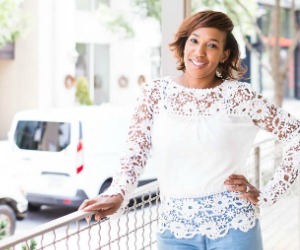 All guests will receive free tickets to the planetarium show, “Back To The Moon For Good” and will have the opportunity to ask Astro, Andrew and a Fernbank astronomer questions about EARTH TO ECHO and space. Participants will also receive one-of-a-kind EARTH TO ECHO items along with free passes to an advance screening of the movie in Atlanta! The EARTH TO ECHO Advance Screening will take place on MONDAY, JUNE 2ND at 5:30pm at Regal Atlantic Station. Space is limited, so please RSVP via the information on the flyer below. Arrive early. To RSVP for the Advance Screening, see below and visit www.RelativityScreenings.com. 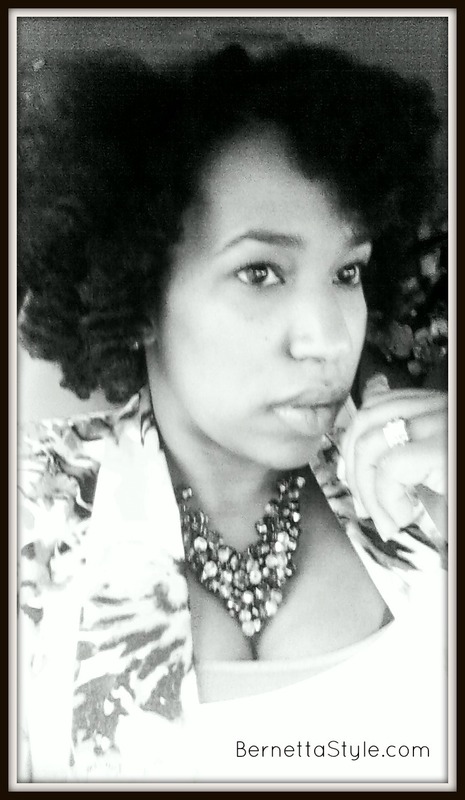 Enter code ETEAtlanta62. The EARTH TO ECHO Kids’ Science Day will take place on TUESDAY, JUNE 3RD. Check-in opens at 11:00AM. Space is limited, so please RSVP via the information on the second flyer below.